The Peak District Mines Historical Society exists to preserve and promote interest in the important mining history of the Derbyshire Peak District and surrounding areas. There are plenty of interesting and rewarding opportunities for volunteers at PDMHS including restoration work, showing visitors around and work on our collection of historic documents, visit our Volunteering page, the Lead Mining museum in Matlock Bath or talk to volunteers who are often on-site at Magpie Mine. Few of us who visit the beautiful Peak District realise just how much of the landscape has been shaped by thousands of years of lead mining history. The Peak District orefield was one of the largest and richest in Britain, and copper was being mined at Ecton using tools made of bone as far back as the Bronze Age (2000 to 1500BC). However, it was the mining of lead which was the most important industry in the Peak from Roman times until the 19th century – with only agriculture being more important for the livelihood of local people. The height of lead mining in Derbyshire came in the 17th and 18th centuries, and the evidence is still visible today – most obviously in the form of lines of hillocks from the more than 25,000 mineshafts which once existed. Less common features such as steam engine houses and larger mine buildings from the later years of the industry can also be seen. In the last 100 years, Peak District mining has mainly concentrated on minerals which were once discarded as waste by lead miners: barytes, calcite, and, most importantly, fluorspar. Increasing use of mechanisation and opencast mining methods, together with agricultural activity, has resulted in the destruction of much of the legacy of centuries of lead mining. Only about a quarter still survives in reasonable condition, and an even smaller proportion has any legal protection. It was the dramatic loss of these features which led to the formation of the Peak District Mines Historical Society in 1959. Since then, we have been involved in the conservation of numerous Derbyshire lead mines – most notably the iconic Magpie Mine near Sheldon, which is the best preserved 19th century lead mine in the whole of Britain. We have also been involved in over 20 other mining projects at industrial heritage sites in Derbyshire, as well as helping to preserve access to dozens of mining sites (both above and below ground), undertaking work to make mines safe, and helping to get statutory protection for the most important Derbyshire lead mine sites. Why not visit us at the Peak District Mining Museum at Matlock Bath, where you can experience the fascinating history of lead mining in Derbyshire and see one of the oldest surviving engines in the world still working – a water pressure engine built in 1819. 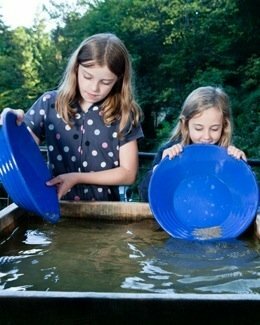 The Museum has activities for all the family – you can go on a guided underground tour of nearby Temple Mine and try your hand at panning for gold. The Museum shop has a wide range of minerals and souvenirs for sale, as well as a good selection of books relating to lead mining history and the Peak District in general. You can also join us on one of our guided Peak District heritage walks to look at the surface features of various Peak District mines, or one of our underground mine trips if you are more adventurous. Through our biannual publication Mining History (which is free to Society members), we aim to promote interest in, and understanding of, mines, mining, the minerals extracted and the communities that depended on and worked the mines. We hope you will find this website informative and that you will visit the sites we conserve, our lead mining museum, and help support our work by joining the society.